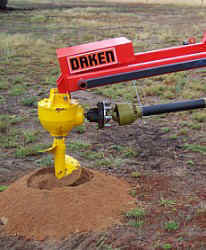 Dakenag produce 3 models of the 3 point linkage post hole diggers; Little Rippa, Series 503 and Series 753. Jibs are made with ample adjustment to achieve the maximum depth hole required. The Little Rippa is designed and suited to compact tractors with a maximum of 25hp. The 503 is a heavy duty digger with a rating of 50hp and is well suited to general farm applications. The 753 is a 75hp rated digger that is more suited to the contractor and those wishing to use bigger tractors. 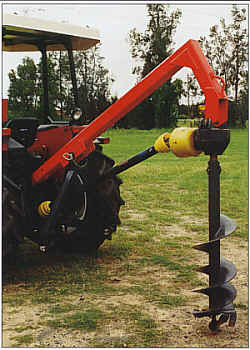 Augers are available in 6”, 9”, 12”, 15” & 18”. This machine is designed for use on the smaller tractors and compacts available in today's market. Ideal for the hobby farm. 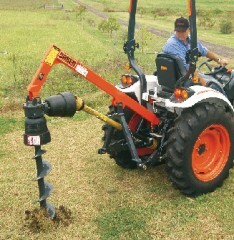 · Augers available to suit 6", 9", & 12"
This Dakenag digger combines solid engineering and quality augers with an 8’ x 3” hydraulic cylinder that will allow you to penetrate even the hardest drought ravaged ground. The machine is built with an intergraded stand to assist you in mounting it to your tractor. 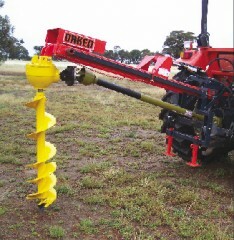 Auger extensions are available should you wish to dig greater than the standard 1.2 m depth. The business end of any post hole digger is the teeth. 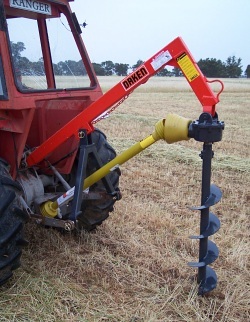 Daken Augers include quick exchange points and cutting tips, which ensure fast penetration and extra long life. 6", 9", 12", 15", 18"